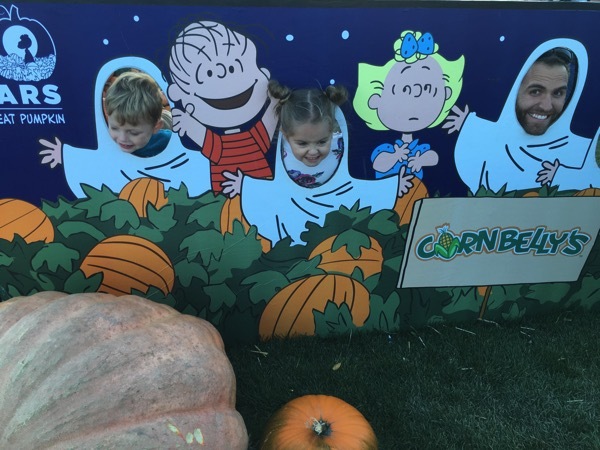 Cornbelly’s might be one of my favorite parts about Fall. 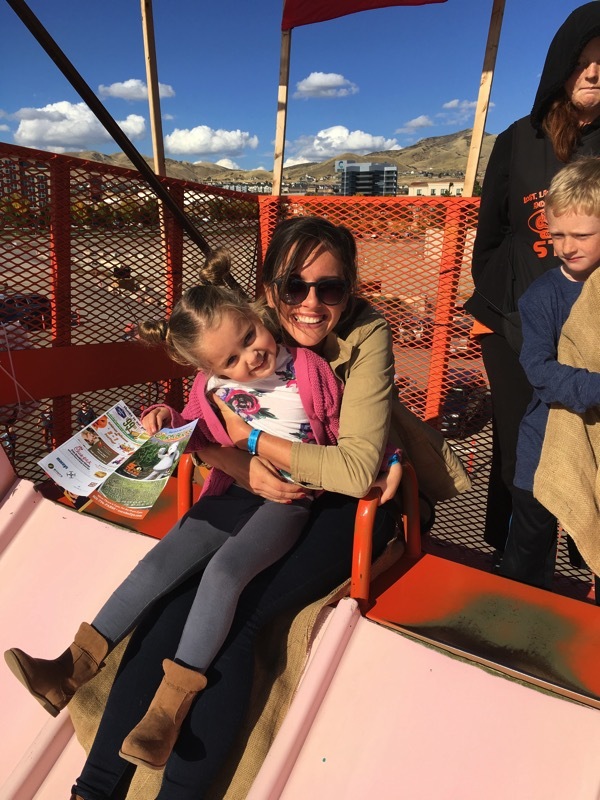 This is a yearly tradition for us so I’ll just start off today showing you a bunch of pictures from Utah’s Halloween/Fall carnival. We stopped by Megan D’s house for a few minutes and I think she won the competition for the best pumpkin anything—> Pumpkin Spice Sheet Cake w/Brown Sugar Caramel Frosting. These were too good. And a few more tangents before we get to the topic of the day. 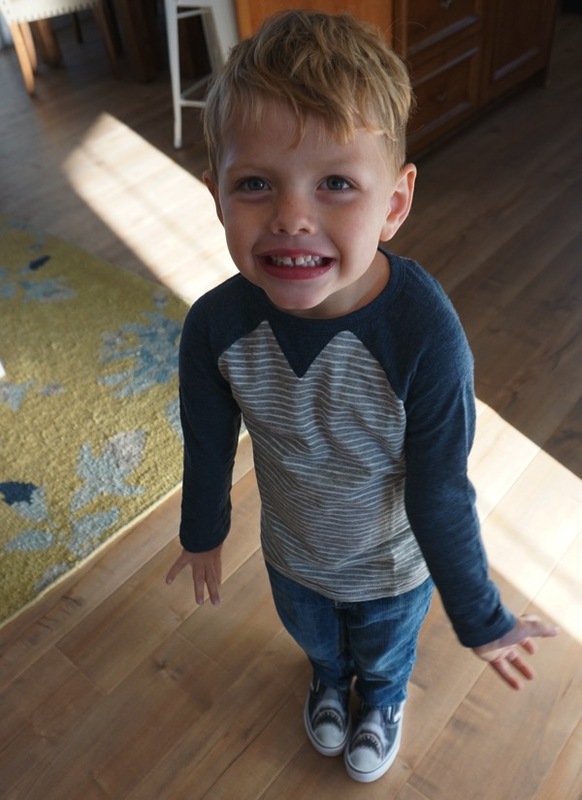 *Knox was crazy excited about his new shark shoes. 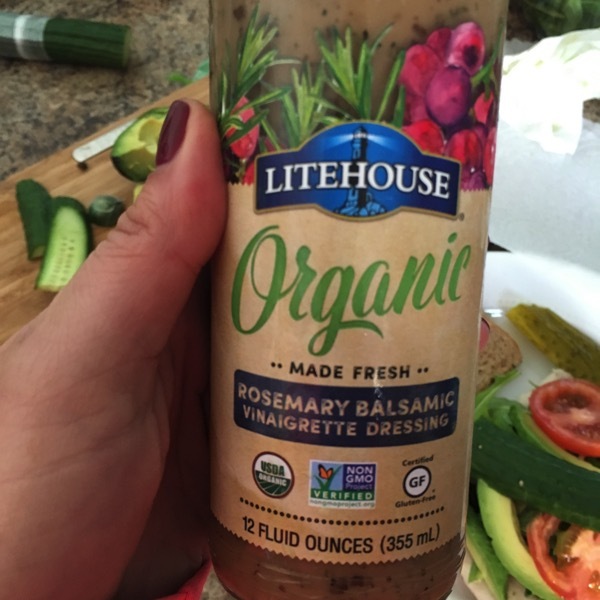 *We love finding new delicious salad dressings and this one is excellent. 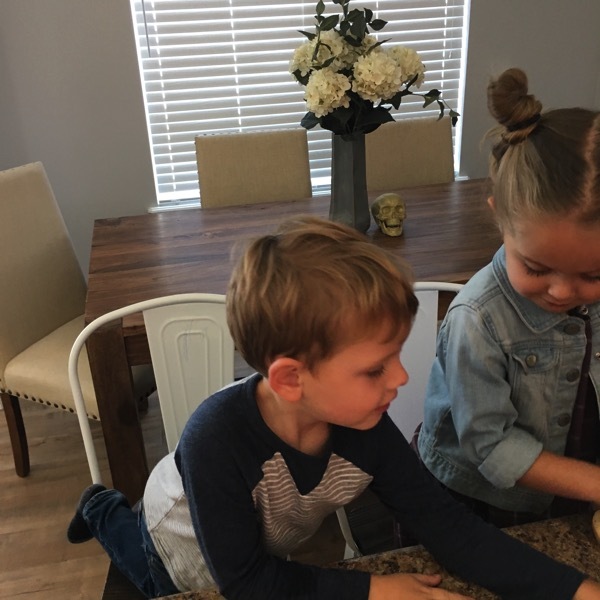 *See that stool Knox is on, that is the middle stool at the table and it has been the source of many disagreements in our home. 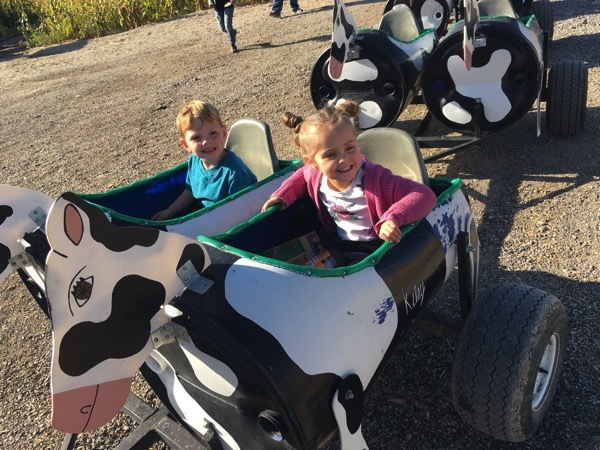 Luckily, Brooke and Knox are on a very good rotating schedule and they remember who sat there last better than anything else. *They got Gushers yesterday and I took out mom/step-mom tax from each one. It reminded me of 4th grade and how excited I got if I found these in my lunchbox. While I was running my marathon last week I got to one point along the way where I started thinking about my very first marathon. I thought about how much my life has changed since then in a million different ways. It then got me thinking (this was at about mile 12) about how I am at least 30 lbs heavier now than I was during my first few marathons (this was before I started blogging). I don’t weigh myself but about a year ago I saw my weight at the doctors (30 lbs more than I was at during my first marathons) and since getting married my clothes are a bit more snug than when I last weighed myself. PS There is a difference between not eating enough calories and working out too much to be a certain weight and just naturally being at that same weight. When I was 30 lbs lighter than I am now it was because I was not eating NEARRRRR enough for how much I was working out. I think my body is around it’s set point right now but during those first few marathons, I was not. I was at a weight that meant I was living off of roasted vegetables and candy and running a ton of miles and doing a lot of spin classes each week. There’s a difference between your body’s set point being x amount of lbs and being unhealthy/disordered to weigh that exact same weight. It puts a lot of stress on your body to live the way I was. I remember being at the starting line when I was so much lighter, so worried about how tight my shorts were or that I needed to lose more weight etc. I was disordered. It was not healthy. I remember thinking throughout those races way back when about how I needed to be doing more and eating healthier because I wasn’t fast enough or thin enough. I remember being completely obsessed with what I ate for the rest of the day after a marathon and feeling awful for any type of indulgent foods that were not on my safe list. I remember recovery from races or hard runs being miserable because my body felt so beat down because I wasn’t refueling it properly. I certainly remember being seriously injured time after time because of the way I ate/exercised and that caused major issues in my bone health and my muscles. I remember fatigue, I remember never feeling good enough and most definitely missing out on a lot in life. Now my life circumstances have changed completely since that time. My eating and exercise was the way I chose to cope, unhealthily,with different circumstances I was struggling with at that time but it was something that I decided, along with professional help, needed to change. So, 30 lbs more than what I used to be at when I first started racing (and at that low weight I constantly felt like I needed to lose MORE which is beyond confusing to me now) I am happy with where I am. When I was thinking about that at mile 12ish it made me happy to think about those 30 added lbs. Those 30 lbs mean health for me. They mean strength, love and an amazing husband that truly loves me to pieces no matter what. That change meant I feel a whole lot better before, during and after my races. They mean that I really only have hard body image days around that time of the month when my hormones are crazy rather than pretty much every second of the day. That 30+ lbs means I’m fueling and moving my body in a way that my bones are healthy (I used to be in the Osteopenia range and really close to Osteoporosis at the age of 25ish) again. Amenorrhea (when your cycle disappears, it is because your body doesn’t have enough energy that is necessary to ovulate) was also a consequence for me when I was 30 lbs lighter. I think we are used to reading and hearing stories all of the time about how much better and healthier people feel after they lose weight. But yeah, I’ve just been thinking about how much better and healthier I am after gaining weight. My running feels better, my head feels better, my body feels better and my focus is somewhere completely different than where it used to be. So yeah, for me… running a marathon 30 lbs heavier sure felt a million times better than those underweight races years ago. Long story short, I think our bodies perform best around their natural set point. The closer we are to our set points, the better we feel before, during and after our runs. Our body has a pretty good idea of where it is happiest, which makes for our best performance possible. If we are eating well, exercising often and sleeping well—> I think we are pretty dang close to where our body feels and runs at it’s best. PS Andrew has a scale and it doesn’t even tempt me. I didn’t even realize it was there until a few weeks after he put it out. Those scales used to own me and now it is just a thing I stub my toe on every now and then when I get up to go to the bathroom in the middle of the night. PPS this picture just makes me so happy! I was 40 pounds overweight in high school. Lost 30 of the pounds and for the next 25 years tried to lose the last 10 but never did. Luckily I have stayed around the same weight (up or down a few pounds) since then but I have always been down on myself for not getting to that goal weight. I’m not thin but finally as a 43 year old I can accept that this 140-145 pound range is the easiest to maintain. My set point I suppose. I love Gusher’s! I’m about to be 32, but when it comes to snacks and whatnot, sometimes I still eat like I’m in elementary school. Yesterday, I had string cheese and Snoopy fruit snacks for a snack–and I loved it. I used to worry about weight a lot more than I do now. It was a constant stream of my inner voice berating me, and it was miserable. 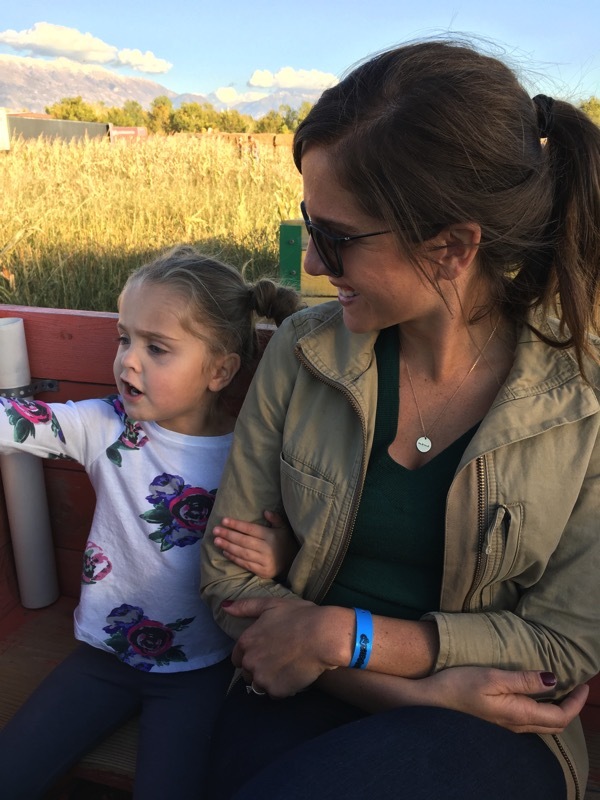 Having kids helped a bit, because I don’t want to pass down those thoughts to my daughters. I don’t want them to think that’s normal. Doing things, like backpacking and rock climbing, where the focus is strong, not thin, also helps tremendously. To some extent, I will have body image issues for the rest of my life, but now I’m better at shutting down that voice and not letting her get more than a sentence out. I have no chili recipes! I will be stalking these comments. Hi Janae! I have gone through a similar experience during college when I was working out like crazy and not eating near enough calories on a regular basis. I ended up loosing my period for 8 months and experienced some nasty anxiety/depression as a result. I used to weigh myself every morning and be angry if I didn’t see the number I wanted. Since then I only step on the scale at the doctors and it has been one of the most freeing feelings. I have since been smarter about my health too, but everyday is still a struggle. I have good days and bad days, but I know my body is happier now and closer to its natural weight. (I totally agree with you on that point! I definitely believe our bodies have a “sweet spot” weight where they are happiest). Anywayy, I just wanted to say thank you for being open and honest about everything in life. You truly make me smile everyday. <3! P.S. I watched you and Andrew's entire vlog from the other day and was literally smiling the whole time. You guys are the best. I always appreciate you being so open about things because it’s so interesting to see how many people are struggling with the same thing but are too scared to talk about it. I’ve always been tall and thin and then in college I gained about 40 lbs. I was definitely unhealthy and was not happy with how I looked because it was not healthy weight gain. After college I lost 50 lbs. I was the skinniest I’ve ever been and it took hard work and some unhealthy habits to get there. Running was my release and it was the main cause of my weight loss so I continued to do it because it made me feel so good. At first I was happy because everyone commented on it but then I realized that for my height, I was too skinny. Every time I was at a starting line I felt the same thing you mentioned above about how I need to lose more weight, then I’ll be faster, look better, etc. Fast forward to now– I’ve had a lot of stress over the past 2 years (actually after my first marathon) due to personal issues and I have gained about 15-20 lbs from where I was. I still have body image issues and sometimes I still do have those thoughts. I used to let the scale own me too and now I only step on it occasionally. I feel very comfortable with how I look and I know that I am not overweight even if my clothes fit a little more snug. As long as I am healthy and at the weight that my body is supposed to be than I am happy with that and I hope that we can all support each other as women in this because it is real. Sorry for the novel but I really liked your post today!! You’re such an inspiration and I’ve loved reading your blog for the past 5 years. I feel like I know you even though you’re like 2000 miles away from me :) Happy Friday! this is my favorite chili to make: http://allrecipes.com/recipe/82768/lauras-quick-slow-cooker-turkey-chili/. Crockpot recipes are my fave anyway, but this chili is perfect. I make it at least once a month (ps- I have no idea who laura is :) I’ve substituted ground beef for turkey to mix things up, and I’ve also been known to dump a can of corn in there as well. It also freezes great, if you end up with leftovers. This is also a great one: http://www.skinnytaste.com/crock-pot-chicken-taco-chili-4-pts/. It’s more of a taco/chili hybrid, so it’s great over rice or cauliflower rice, or inside tortillas. I deal with the same thing…………….some days I feel awesome and hot and gorgeous, other days I notice the smallest things. I try not to think about the scale…………I used to feel like it consumed me, but now I am 10-15 pounds heavier than then, and run so much more. I think I look the same, and most clothes fit the same. I am so much better than I used to be but still have those “fat” days………………..I think we all do. 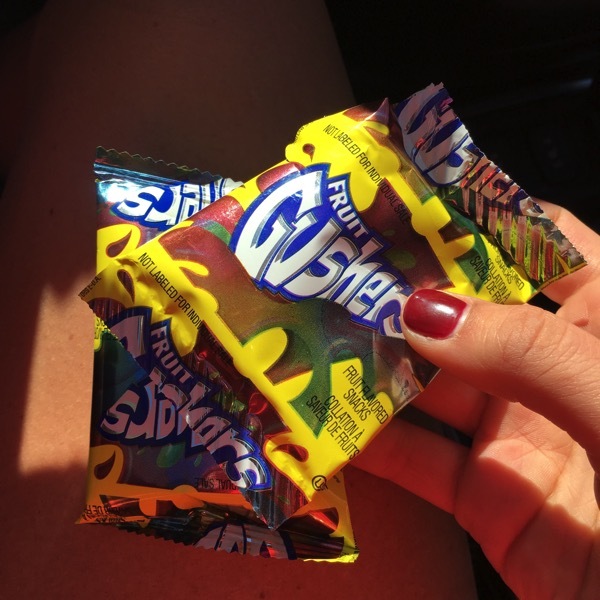 I love gushers. And fruit by the foot. Soup: rotel, cooked ground beef or turkey, corn, kidney beans, black beans, garbanzo beans, heat in crockpot and serve with shredded cheese, sourcream, and tortilla chips. You can also use it on top of a plate of chips and lettuce, more like nachos. Oh, girl. The scale was mine enemy. I basically didn’t eat from age 11 until I was… 23? I’ve had a few relapses since, but honestly what changed it for me was having my daughter at 34. When they said it was a girl, it was like a huge revelation that I could NOT let her grow up with my disorders. Something in me changed drastically… and while now I am a bit “fluffier” than I would ideally like to be, I couldn’t really care less. I never say a negative thing about my body or her body or anyone’s body around her (or really, in general). I really hope I set her up to succeed – I wasted SO much time and effort on such a stupid, stupid thing. Have you been on a roller coaster at all with your weight and how did it effect your running? Oh boy. I’ve gained 40lbs over my running life time. I run at all weights, it’s just a little harder when I am heavier. But my weight has more to do with eating than running. Fruit snack that reminds you of your childhood? What was in your lunch box? Lunchables!! Those were amazing. The nachos! I really needed this today. You are awesome, Janae. PERIOD. ENOUGH SAID! *A healthier version of cornbread! Comfort food at it’s finest! :) Hope you enjoy! I ran the New Orleans Rock N Roll Marathon as my first marathon last February, and it was amazing! Lively city, beautiful course. I really enjoyed reading here, especially while training / physching up for the race. The scale and I are not friends. I’ve lost 40 pounds in the last 5 years (since I started running) but feel like most of that was in the first few years and I can’t get the scale to move more! I want to lose another 30+ pounds… but Have been STUCK! Hi Janae – wow your blog today speaks to me on so my levels. I have fought my body image issues for most of my life. I turned 49 years old this year and about a year or so ago I quit weighing myself because the number on the scale that day dictated how my day was going to be. What a horrible way to live:( I try to live each day staying very active and try to eat healthy (although with pumpkin season sometimes its hard since I am fanatic about anything pumpkin) I even have a Pinterest board labeled “All things Pumpkin”. 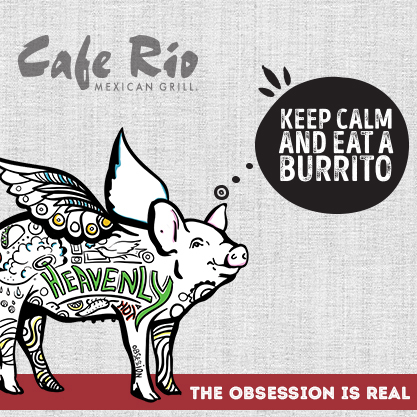 All things in moderation. A hard thing to do for a Virgo and Type A personality…. Also, wanted to so congratulate you on your awesome marathon!! You rock girl!! I had two friends of mine from NH run the same marathon so I tracked them and you on my cell phone that morning. Have a blessed day and a great fall weekend. Savory Butternut Squash Soup…we had this last night and my husband couldn’t stop eating it. You can even leave out the cream and it’s still just as yummy. I’ve been struggling with disordered eating and body images for the last decade and it’s outrageous the amount of scrutiny we put on our bodies. My legs are at least 2-3 times bigger than they were a couple years ago and while it’s made me absolutely panic … I’m so much faster and stronger. It’s hard for me to deal with mentally sometimes but I keep trying to remind myself that it’s better to be healthy (and a little bigger) than broken. The way your life has transformed and your mind has shifted is such an inspiration … I’m so happy for you and hope I can get to that balanced feeling myself! I have a great soup recipe to share! It’s from the blog “How Sweet Eats.” It’s a white bean, tomato based soup with wilted spinach! I usually skip adding the tortellini, but it’s also delicious with it, if you’d like to follow the traditional recipe. This is one of my go to soups! Perfect for chilly nights! 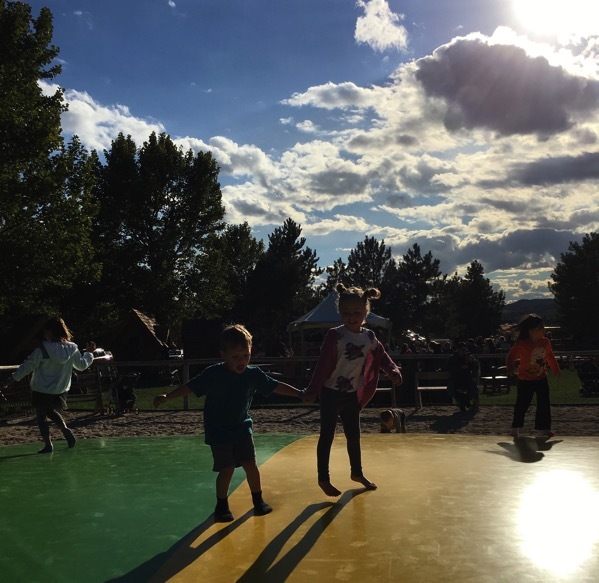 Wonderful post Janae and it was great to read this. I think as we get older, our views about life and the scale change. It’s clear you have such a great view of training. Loved reading this! Oh my goodness! Where did you guys get those shark shoes for Knox? I have shark-obsessed three-year-old twin boys who would go CRAZY for those! I weighted myself after years without doing it and found out I was 136 lbs. I used to be 8lbs less. And even though I don’t see myself in the mirror and think I’ve gained weight, it concerned me a little bit at that time. I feel healthier and stronger now than when I was 8lbs less. Mt dearest Janae, thank you for this post. I think when our bodies are at their happy #, is when we look most radiant and healthy too. I am a good 15 lbs heavier then a former version of myself and gosh how did I think the bags under my eyes, pale skin, and dry hair were worth a lower number on the scale? I think we come through this so that we can help others who are stuck in the disordered thinking. Just think of how many your post will touch today. The most my weight has fluctuated in my adult life in 30 lbs- I am now 20 lbs lighter than my heaviest and 10 lbs heavier than my lightest. My body seems to be stuck here, which is just fine with me! Janae, you are so beautiful and look amazing and happy with your current body. I have a similar past with my body perceptions and although I am maybe 20 pounds heavier now that I was several years ago, I too am so much more happy, healthy, and truly appreciative of my life. Thanks for sharing! Janae this was exactly what I needed to hear today; after four years of doing everything in my power to carve my body into a form that it’s not naturally meant to be at I stopped. I gained the weight, got my period back and, ultimately, got my life back. Last night I was just feeling down on myself for my clothes fitting a little snugger – thank you for the reminder that I gained SO much more than pounds ( focus, stronger running, a healthy mind, body & spirit.. the list goes on!). 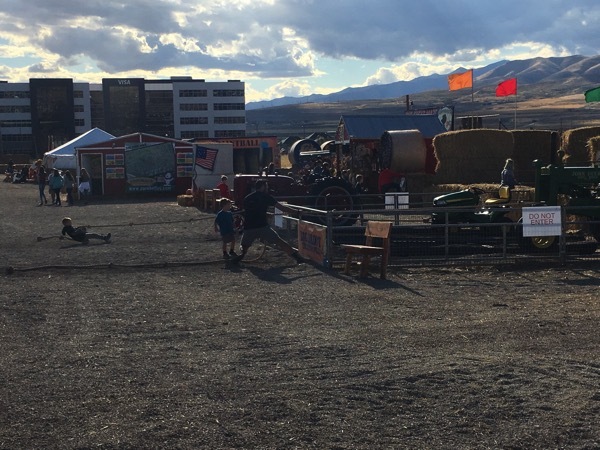 Great post – thank you for sharing! Great post. I was hoping you could tell me where you got your jacket? I definitely had issues with weight in college. I had been slightly overweight entering college and then I over corrected. I’ve since stabilized and developed a better relationship with food and exercise. I agree about being at a happy set point, but part of my brain was never happy with it. A while back you commented that you developed a different relationship with your body after being pregnant and that you stopped worrying as much. I’m due in a couple of weeks and that comment has really resonated with me. I’ve never been more comfortable with my weight because I really respect what my body is capable of doing. I love this. 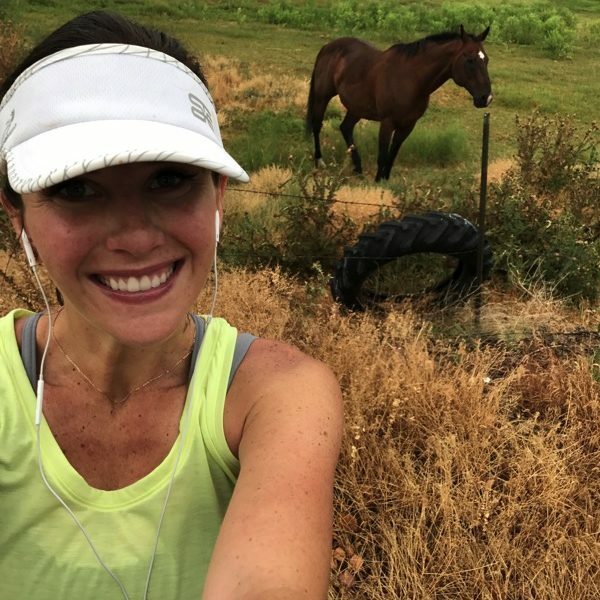 I love that you shared your body image stuff and how it relates to your running stuff because I think in resonates with SO many of your readers. I’m a college student a regular reader- your blog has been a game changer for me in terms of health, mental wellbeing, running, etc. 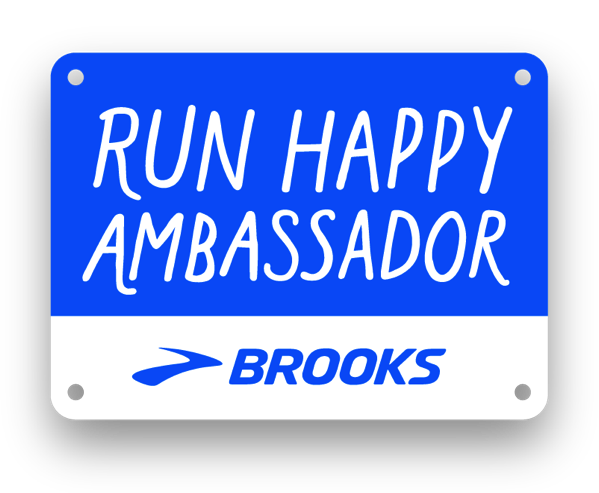 On Sunday, I’m running my first marathon (partially inspired by your blog- woohoo you go!). I’m scared and excited and nervous but also so proud. I gained weight marathon training (I went from 5 days heavy lifting to lots of cardio so things just got a little less firm and more squish?? ), but I’m so okay with it! It’s worth it for me to do this. I was sidelined for months last winter for an injury after running a half marathon at my lowest weight I’ve ever been. Now I made it through marathon training with only moderate aches and pains- huge!! This was a really powerful post. Thank you for sharing. I’ve been there and it’s such a hard thing to overcome…I’m sure a lot of people reading can relate and it’s so refreshing to see how far you’ve come and continue to grow. I wish more people would speak out on the serious issues such more often. Health and happiness are so so so much more important than looks or weight, and it’s great to see that you see this now! THANK YOU for this! 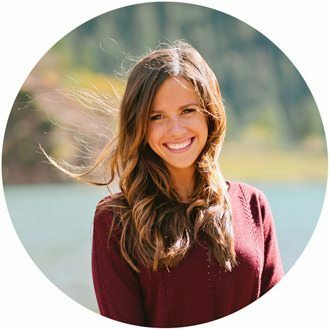 Your healthy relationship with food/exercise/your body is one of the many reasons I read your blog daily :) I have struggled with disordered eating/anorexia and over exercising for most of my life, and it has brought me nothing but pain and unhappiness, not to mention significant struggles with infertility due to amenorrhea. I cringe thinking about how much brain space I wasted over the years obsessing over calories/food/exercise, etc. We, as women, have SO MUCH more to offer this world than our pant size. Whenever I find myself falling into old habits/disordered thoughts I remind myself of what’s really important in this life and it’s definitely NOT my weight/appearance. I’m so glad that you’re feeling healthy and strong now. I remember when I was suffering from several eating disorders I felt so alone. I wonder if the Internet had been more popular then, and I could have read about stories like yours, if I would have asked for help sooner. I remember towards the end wanting to ask for help but feeling so ashamed and so alone because I was the only one I knew who was dealing with disordered behaviors and I thought it was a sign of weakness. 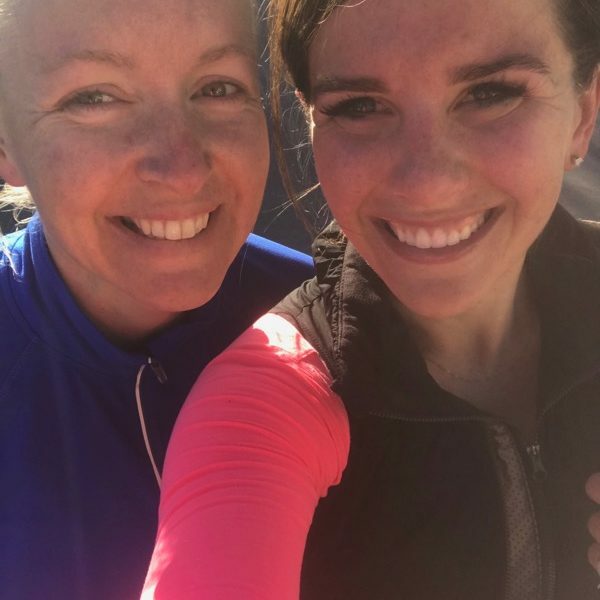 I’m glad I have found such strong women in the online runner community to connect with and to share experiences with because it seems like so many of us have dealt with disordered behaviors and are in healthier places now! Check out the blog: twopeasandtheirpod.com. She has the most amazing recipes and tons of soup and chili. Her recipes are usually healthy and full of veggies. My fav chili is the vegetarian quinoa chili. We live off soups and stews in cold weather! This is a great, healthy chicken noodle soup recipe, kids love it too! I just made this the other night and it was a HUGE hit with me, my hubby and my picky 3 year old. It basically tastes like lasagna…but as soup…what?! I am only 6 weeks pregnant and stepped on the scale today. I have gained ONE pound from my pre-pregnancy weight and it has been bothering me all morning. So stupid… it truly is. One pound. It is probably just bloat and a bit of water weight (my boobies are definitely larger!) but I am like “Maybe I didn’t work out hard enough this week?” “I shouldn’t have had spaghetti and meatballs for dinner last night”… I can’t let this consume me but I am worried about how I am going to handle the scale for the next eight months. Does anyone have any words of advice? You need to seek professional help if you’re that concerned about gaining weight right now. You need to be focused on listening to your body and taking care of yourself, both physically and mentally, not worrying about what you had for dinner last night. Thanks for the reply. I actually ordered several books from Amazon this weekend that helps with this! I also talked to my husband about how I was feeling and he was super supportive and understanding. He also helped bring me back to reality that it is OK… and it will be ok! I agree with Leah. I would be proactive and seek help right now. It’s okay if gaining weight during pregnancy is a bit of a mental struggle–it is for many women!–but if 1 lb at 6 weeks is already consuming your mind for an entire morning, I think you’re going to want some assistance, so you can be happy and healthy for you and your baby. For the record, I am 22 weeks pregnant and have gained 14 lbs, and I feel confident that it’s exactly what my body needs. I haven’t really changed anything about my normal routine. I eat when I’m hungry, I move my body daily…gaining weight is just something that happens! Be kind to yourself, and I bet you’ll find you gain just as much as you need. 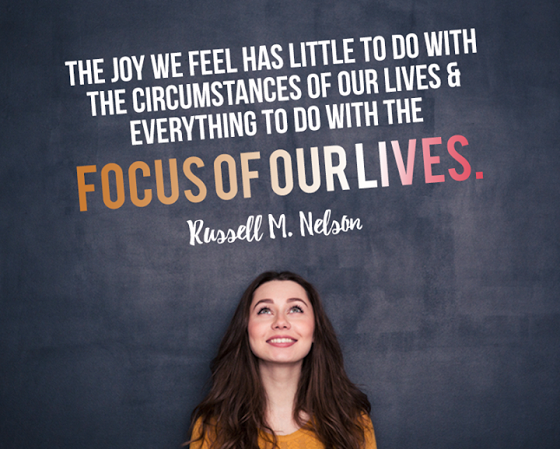 As you move forward, I suspect and hope you will find you have many, many more important things to focus on other than your weight (like your baby’s health! and getting ready for labor! and fun things, like designing a nursery!). Best wishes to you and your little one. Thanks so much for the encouraging words! I ordered a few books from Amazon that are educational and am excited to start reading them. Already, I am trying to focus on this is not weight gained from chowing down on cheeseburgers and sitting on the couch… I am growing a human and my body is doing what it needs to do. I am going to keep focusing on eating healthy when I can and staying active. That is all I can do! I was always the (naturally) skinny tall girl growing up, and when I gained some weight in college I went through a period of too much exercise, not enough calories. And I was miserable. I’m definitely very conscious of what I eat, but now it’s more for the right reasons–I want the food I put in my body to have good, healthy, results, instead of making me feel sick or constantly hungry–or the worst to me–break out. There are still times when I eat a piece of cake and my mind goes–GO WORKOUT NOW–but I always remind myself that I eat healthy, exercise regularly, and that it’s OK to indulge. Our bodies need calories to function properly, especially as runners. Hi Janae! I am a long time reader, but have never commented – I feel like I can relate to so many of your posts, especially this one! First of all, I hope you know you look fantastic and are so strong – way to go on the marathon, by the way! I have always struggled with body image issues during high school and still do now (I never really realized the thoughts in my head were being so hard on myself). I am 24 and think I will always struggle with this, but your honesty helps remind me we need to respect and love our bodies just the way they are! One thing I try to remind myself when I am running is to be thankful to have a body that can run and achieve fitness goals. I greatly appreciate your honesty about the ‘hard things’! From one of your past posts, you mentioned a quote ‘I can do hard things’ – I repeat this in my head over and over during hard runs when I want to quit or even when life throws something my way that I just don’t think I can handle. It’s a simple saying, but it just reminds me we are so much stronger than we think. Thank you for being genuinely open with your readers! I am so happy things have turned around for you – I hope you have a fantastic weekend with your adorable family! My mom is anorexic and I was overweight. I got a bit obsessed when I was losing weight and drove myself a little nuts. I’ve blogged on the subject and how it took me a long time to have a healthy relationship with food. Right now I’m heavier than I’d like to be but I don’t go into crazy mode over it any more. I know the weight will come back off but there was a time I would have punished myself over it. 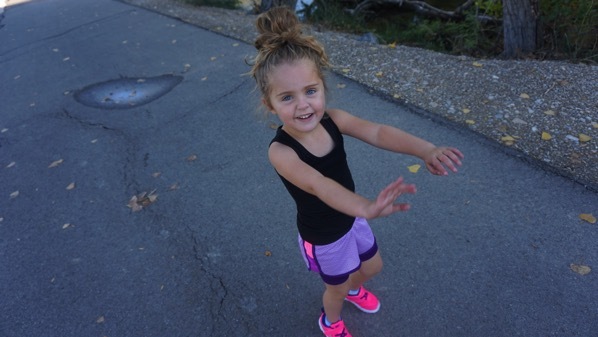 I love that you’re teaching Brooke to be healthy and fit. I try to see the scale as information but I no longer hop on and off every day. This is my go-to chicken soup recipe. You can add white beans as well. (I add them to mine but leave them out of my husband’s). In a large pot sauté the onion in olive oil over medium-low heat for 3 minutes. Add garlic and sauté another 2 minutes. Add the carrots, blanched escarole and celery, sautéing for 5 more minutes. Shut heat off and let sit a few minutes before serving so flavors can blend. Remove the smashed garlic and bay leaf before serving. •	To blanche: place in a pot or heat proof bowl and cover with boiling water. Drain after 1 minute. Escarole should be bright green, rinse with cold water to stop the escarole from continuing to cook. Add all ingredients to a large stock pot and bring to a boil. Lower to a simmer and cook for 1 ½ hours. Remove carcass from pot with tongs and strain broth through a sieve into a large container. Remove any solids from broth and let cool. You can cool broth quickly by placing container over an ice bath. Refrigerate until ready to use. You can freeze the stock if you will not be using it within a day or two. I do own a scale now, and I get on it daily. I find it can be really helpful after hard workouts to determine just how much water I lost and how best to rehydrate and refuel. Also, it’s been eyeopening how skewed scales can be! For example, sometimes I will gain 5 pounds in a day depending on how much I drank, and when I last ate. Then the next morning, all is back to normal. It has taught me that weight fluctuation is to be expected! Thanks for posting this! It’s great to know that someone else is going through the exact. same. struggles. Have you ever tried Skinnytaste’s Crock Pot Turkey White Bean Pumpkin Chili? It’s amazingly good!! I make it every Fall. I was just looking for that recipe and couldn’t find it! Soooooo yummy, thanks! Thank you! This post was so important, so real, and so relatable! Pretty much what you just described is how I felt and still at times feel, about my body/weight/ect. But hearing your story and relating to it so much is so helpful because a)I dont feel alone/crazy/weak and b)I know I’m on the right track. Thank you, thank you, THANK YOU for this post. You had me worried the other day when you were posting about stair climbing and running right after your marathon, but then you go and post this. Thank you!! It’s so refreshing to see a “run blogger” admit to weight gain, and what’s even more… admit to being HAPPY about gaining weight. You’re right, we all have a set point, and weight is very dynamic. Especially for us women, things like hormones and having babies can cause shifts in weight. As long as we eat healthy and exercise moderately (or eat tons when in beast mode), our body will find what weight it’s healthiest and set itself there. This post took bravery, and I am so proud of you for it. I’m sure many of your readers are vulnerable and impressionable, and reading that a gorgeous young woman, and a talented, FAST BEAST of a runner became better — inside and out — with weight gain will help so many of them. Thank you, Janae, from the bottom of my heart. We need more bloggers like you. You are so brave (and Right) to be posting about weight gain! I am at a good place with my body right now too. For years I focused on nutrition not food, I wasn’t eating vegetables or fruit I was eating vitamin A and C, I was eating iron and antioxidants. So much pressure to get it right! Now that I just eat food again, I look and feel better. I’m glad your Brooke has such a positive role model! Hearing you talk about how strong your body is not how fat or how skinny. I am constantly telling myself to be proud of the strength of my body and what it can do, especially when I’m having an ‘ugly or fat’ day :( Positive reinforcement works on us too. We love Ashley’s (Edible Perspective) veggie chili and she has a recipe for pumpkin cornbread too! This was a FABULOUS post, Janae. Thank you. Honestly, you look amazing and happy from the inside out these days. You are still a very thin, fit runner and the difference is you are healthy/happy now & it sure shows!! I was way underweight and obsessive about the scale end of college/ a few years after I graduated college. I am much more relaxed about it now- wouldnt say im 100% but i’m getting there. I would recommend any soup/chili from Courtney @ Sweet Tooth Sweet Life. She just posted an awesome looking chili recipe. I so needed to read this today… Wow thank you! Thank you for this post. You look fantastic and truly radiate happiness. You and Michelle of the cookie chrunicles and Michele of paleo running momma have been great role models . And the fact you put this post out there allows me to read through the comments to hear others’ experiences. It really helps for me to read these other stories. I am 38 yrs old and for 21 years I have chosen restricted eating as my coping mechanism. I haven’t gotten my period in those 21 years! I don’t want children so it wasn’t an issue for me. When life was stressful over the past 2 years, I dealt with it by eating less (I deal with all stresses by eating less). I am not one of those people who can run and feel weak. I work out a ton at the gym instead. Just running feels miserable. My legs feel weak. I know that if I want to run well, I must get over this. And for the first time in 2 years, now that the life stress is over for now, running is more important than being weak and non-energetic. I have a goal to train for a marathon again (I last ran one in 2014). For me, running helps a ton. IF I want to run, I must eat well. I know for some others it can be the opposite – they run to pare down. But running for me feels awful when I’m too light. I truly believe that stronger= a faster more successful runner. It was fun running into you at Cornbelly’s! We don’t have a scale in our home, although since having my last baby I’ve been tempted. I don’t think it would be good for me, though. Thanks for the positive reminder! I love this post. Look at all of these comments from those who can relate. (And think of all of the people who read and relate and DON’T comment!) This is beyond common; sadly, it seems more like a norm! And it’s so important and inspiring to be REAL about it and put it all out there. A really valuable use of your platform. Thank you. My favorite runner, Lauren Fleshman, contributed to a podcast recently on disordered eating/body image and runners. Check out the Running On Om podcast #213. 1. 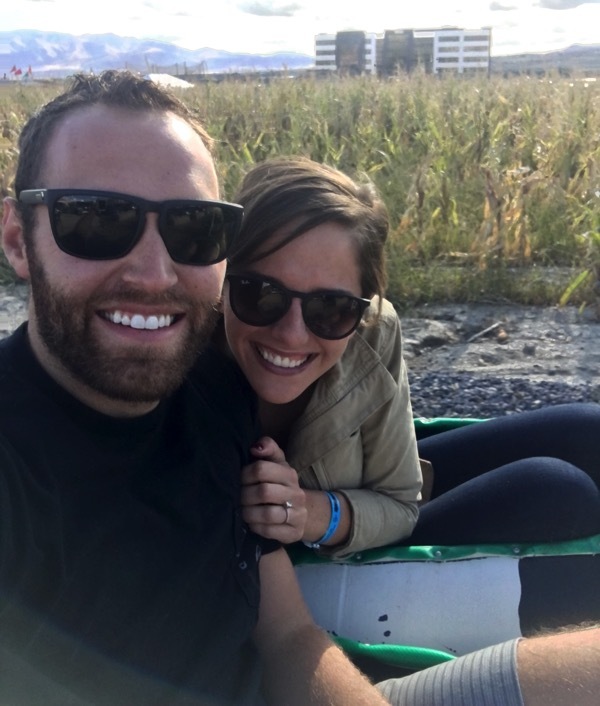 Watched your VLOG and you two are adorable! I think what you have is really special! 2. You look great and am so glad you shared your story above. 3. I used to weigh myself DAILY and put the number in my phone. Then life happened and the few lbs I gained (like 2 or 3) would put me in a BAD mood and make me restrict etc. So I said screw it–this is UNHEALTHY…I weigh myself maybe 1x per week and honestly it’s just information rather than something that causes mood changes, sadness etc. It’s taken me years and years to get to this place but think I am finally ok with whatever it says which by the way is almost always the same. Funny how that works when you pay less attention! 4. Let’s discuss the amazing number of CHILI recipes above! Andrew is going to LOVE it. Please report back on which one you try! This is just what I needed to hear today, thank you so much for sharing Janae! I too have gone from being really unhealthy to gaining about 40 lbs since I was at my low. I try not to weigh myself, but I had a series of doctor appointments that showed me a number that sent me back into self loathing. I got to a better place mentally, but was eating a lot of junk so decided to do Whole30 with my boyfriend. I didn’t weigh myself before or during, but yesterday was the last day of the cleanse and I wanted to check and see how ‘good’ I did. Luckily both scales I tried this morning were out of order, and after reading this I’m not going to try again. I’m eating healthy, I’m exercising and I have wonderful people who love me no matter what size I am– thanks for the reminder! I definitely have a love/hate relationship with the scale. It’s gotten better after having kids, especially a daughter. We talk a lot about health and how our habits affect what we want/can do, not how we look. It’s especially hard during a hard training round because I’m tired and hungry all of the time, so it’s all about finding hte balance of eating healthy to fuel my body for strength and endurance. For our chili recipe, I honestly just throw in a bunch of different cans of beans: chili, white beans, kidney beans, etc and leave it in the crock pot on low for 4-6 hours. My sis in law makes a leek soup that is amazeballs ;) http://www.popsugar.com/food/Julia-Child-Potato-Leek-Soup-Recipe-24339863. I love to dip sour dough bread in it. I totally agree about weight gain! I used to watch my weight like a hawk an didn’t eat near enough. After training and running so much I begin to realized the beauty of what my body was capable of rather than the number of the scale. It took a long time for me to shift my mindset, but we can focus on other things other than the number on the scale it makes life so much more enjoyable in general! I have never, for one single minute thought you were anything near over weight! You are beautiful! I really needed to read this today. I have struggled with negative body image thoughts most of my life. The last few weeks I have really been trying to not be so hard on myself about food and just excited I can run again. I have had a slew of injuries because of my low bone density and finally can run again. I too have missed out on a lot of life because of my fear of gaining an extra pound. I declare NO MORE. Every time you say that you are going on a random tangent, it seems like it applies to something I have been thinking about. Thank you so much for blogging…you have really helped me out on my low days. 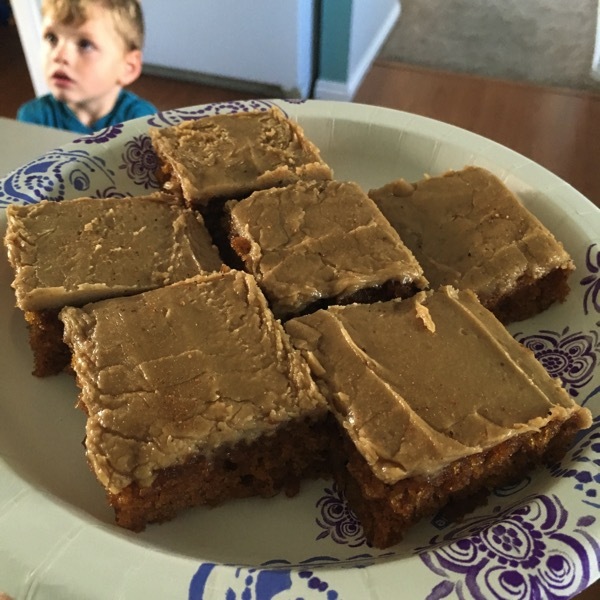 Omg I need those pumpkin bars! Strong is the new skinny! I was thinking you looked lean in your orange hoodie and shorts this week (one of the pics)…. Lean muscle mass – it weighs more, but looks good! Thank you for sharing this, you are a gorgeous human being! It got me thinking about my sister’s daughter…she has MS and is 17 and wheelchair bound. Even if she could walk and stand on a scale I doubt that she would, it’s difficult for her to even lift a fork and put food in her mouth. I do know that she dreams of running for miles with the wind in her hair. Thank you for this post! I am a loyal reader to your blog and your honesty is so refreshing. You have a beautiful family and I truly appreciate every post! I don’t have issues with the scale. I mean, yes, when I get on the scale and it’s higher than I thought it would be (at the doctor yesterday) it’s kind of a bummer but it doesn’t change my eating or lifestyle. I know that the scale is not an indicator of true body composition and certainly has nothing to do with my self worth! My first degree in in Dietetics so that kind of helps my outlook. Here’s the link to one of my favorite soups! Hope they don’t clog up as spam! I stayed at a pretty consistent weight through high school of 125-130lbs. I ate like crap but was active. After I graduated i found myself in an abusive marriage. I turned to my diet and exercise as a way to seek control over something in my life while so much of it was rigorously controlled by someone else. I learned a lot about nutrition, but took it to the extreme. As a way to escape what was happening at home, I’d run for as long and hard as I could. I dropped down to 100lbs. I finally escaped the relationship but the mental, emotional and psychological effects were so much worse and longer lasting than the physical. For the next year as I fought for a divorce, I found myself losing more and more weight. I started eating cheeseburgers and fries and candy but I couldn’t out eat the emotional toll and eventually found myself at 83lbs, hospitalized for syncope. I met a new guy who saved my life. In him I found happiness and a support system. He helped me find my way back to health. We eventually broke up and my eating got out of control again. I was back to 130lbs but happy when I met my husband a couple of years later. He’s a foot taller than I am, 100lbs heavier of pure muscle and a born and bred Texan. Read: all the meat and potatoes and fry all the things. When we got married and found out we were pregnant, I stood on the scale at the doctors for the first time in almost a year and saw 146lbs. Technically overweight and almost obese for my height. But I was happy. Fast forward and we now have 3 gorgeous boys. Our youngest will be 9 months old on monday, our oldest is 4. I’ve found a happy medium in my life between being active because I love to move my body and lead my kids to and healthy lifestyle through exemplifying it, eating well but enjoying treats. I don’t weigh my food or measure my serving sizes. I don’t obsess about what I eat. I make conscious decisions to provide my family with nourishing meals more often than not but almost weekly we enjoy Papa johns. We have donuts when on our way to hikes, my husband and I eat cookies and ice cream almost nightly and I never feel that desire or need to punish myself afterward. I’m finally, truly happy. We don’t own a scale and the number wouldn’t concern me anyway. But I did have a physical last week and eating this way, eating what I crave but mostly eating healthy, balanced meals and staying active with my family, I weigh 112lbs. A healthy, fit, strong 112lbs. Of muscle and strength, inside and out, not the skin and bones I once was. I look back and no longer recognize that person I once was. And I’m so grateful to have reached this point in my journey. Thank you so much for sharing! I can’t even imagine you 30 pounds lighter than you are now–I’m so glad that you have such a healthy perspective on it now and that you’re able to talk about it and reach such a large audience. I grew up very overweight and lost about 155 lbs. from ages 16-17 and definitely had a very unhealthy relationship with food and my body as a result. I was diagnosed as anorexic the summer before my senior year of high school. I gained some much-needed weight but then kept going, and while I never got anywhere close to my original high weight, I still felt fat and was definitely unhealthy. Then 7 years ago I started running, lost 30 pounds and finally found what seemed to be my set point, but now, 8 months after having my first baby I seem to be stuck about 10 pounds higher than I was pre-pregnancy. I’m still a perfectly healthy weight for my height and I run, walk and do yoga, and while my diet could definitely stand to have a few more vegetables, I think I’m starting to accept that maybe this is my new set point, and I would rather indulge here and there and focus on exercise and being a good mom than what the scale says. This is a favorite in our house any time of the year . I 2nd this! It is awesome! You look beautiful Janae, inside and out. Thank you for sharing this with us. Hey! Since you love lasagna, you will love this soup. It is our favorite. Have a great weekend. Thank you so much for sharing this. Sometimes it is just so nice to read something that makes you feel like you aren’t alone. During the middle of college, which was a couple of years ago, I was about 10 lbs lighter than I am now (which isn’t a lot, but it seems like a lot to me). I just got weighed at the doctor, and had a freak out moment because of it… but then I realized: when I weighed less, I was ALWAYS (seriously, I couldn’t think of anything else) calculating just how much I could or couldn’t eat, just how much I would burn through exercise, etc… I would notice other people’s weights all the time and compare myself to them. I had no joy. I remember sitting in worship and realizing that I could literally think of nothing else than what I would eat the rest of the day (really, what I WOULDN’T eat). That is when it really hit me that I needed help. I guess I just wanted to say that you are so so right, sometimes gaining weight really is the best thing for you health wise. I feel so much better physically now, even though that number might be higher. For me, as I recovered, that meant I gained some weight. But I also gained my life back. 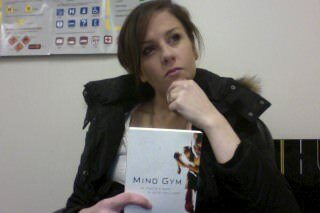 Mindy Kahling has a great quote in her new book: “Even though I wish I could be thin…. I don’t wish for it with all my heart. Because my heart is reserved for way more important things.” That is how I feel. I want my heart to be used for thinking about the Lord, for loving my husband and my job, and for living life with joy, instead of being obsessed with a number. Sorry for the long post, but this really spoke to me! Boy this came at an interesting time for me. I 100% had disordered eating for many years. Getting married and having kids changed a lot. I noticed that when I was eating well my races were strong. Fast forward to recently and I have had some high stress in my life and despite eating ok (not stellar) I have apparently dropped a lot of weight. My coworkers and a friend talked to me this week and I have been in shock. I just had not noticed or maybe denied it! I also am battling a month long run of insomnia. It is a scary place to be in right now but I am hoping I can take better care of myself. So thank you for the timelessness of this post!! Thank you for all your honesty and for being real and most importantly for sharing with us your real feelings. My daughter had an eating disorder in high school and It was tough to be open about it with others. You are the best. I definitely had a hard time when I was heavier and trying to lose weight (high school, college, post baby) where now I focus on training and my body loses weight to a point and then no more. I feel like I gain weight when I diet or if I am focusing on my weight. Part of why I love running is I can focus on just being healthier without thinking about a goal weight. I LOVE that quote!!!!!! Saved it for my phone background!!! ? Ah, this is why I love your blog – your honesty and willingness to share the tough/uncomfortable stuff! I can definitely relate but I still am struggling to get to a healthier mindset. I have gained around 20-25 pounds in the last couple years, post divorce. It 15 of those pounds were necessary but the other 10 have come from stress eating. It is funny how when I was extremely stressed I hardly ate at all, and then became only very stressed and reached for junk food to help cope. Now I’m trying to lose the weight and have finally decided to stop with the yo-yo dieting and to just try and eat today how I could for the rest of my life. It’s tough as it has made me very self conscious surrounding dating since I used to be a lot thinner, but I am working on my self image by not stepping on the scale and surrounding myself with people who build me up. As for it affecting my running, I started running more than felt right for me just to burn calories. I became obsessive about the amount of miles I was putting in. My doctor has told me that I’m at a healthy weight, if I lost 10 pounds I would still be healthy, but that I very well am at my set point so we will see what happens as I continue to just eat healthy and exercise, without doing it to burn a ton of calories but because i love it! I have taken a step back from long distances and am doing more weights and stuff so I can work on building a healthier relationship with exercise. I was volunteering at the food bank today and saw so many good childhood snacks. I was all about the soda pop snacks; I haven’t seen those in forever! Sorry Andrew, no recipe for you but I am sure you will have many to sort through! It is inspiring to hear your story, Janae, and it gives me hope that the tough times I have been through are all for a purpose that will reveal itself one day. I am actually very happy in life today but I definitely have that nagging fear that I will always be alone and never have children. Thanks for talking about the hard stuff! I’ve also suffered from an eating disorder in the past, and it’s nice to know you’re not alone! As others have mentioned, I love your honesty! My family loves this chili recipe, which just happens to include pumpkin as well! I’ve gained about 10 lbs. from when I first started distance running and definitely feel much stronger now…I look back on how I used to be and realize that I really didn’t look healthy or fit, just frail. I have two daughters and they have really been the impetus I needed to get my act together with accepting my body and kicking my obsessive weighing habit (I used to weigh sometimes 2-3 times a day, and now check in with the scale maybe once a month at the most). What an important post. Thanks so much for sharing your experiences. You are right–this stuff is hard to talk about but you do it with an authenticity that is relatable and matter of fact. Congratulations on your marathons and thanks too for your thorough recap–you share all the details I really want to know! In a large stock pot, combine broth, squash, onion and apple; cover pot and bring to a boil over high heat. Uncover pot and reduce heat to low; gently simmer until squash is very tender, about 10 minutes. Puree soup in pot using an immersion blender (or puree in a regular blender in batches, careful not to splatter hot liquid). Season with salt, pepper and nutmeg; serve. Yields about 3/4 cup per serving. This is the best white chicken chili of all time! A family favorite and even won a chili cook off :)) enjoy! >You can also add a cup of cheese for more richness..
>> Saute chicken, onion and garlic powder in oil until onions are tender. OH MY GOSH! I don’t even know where to start…Thank you for having the courage to share your story. 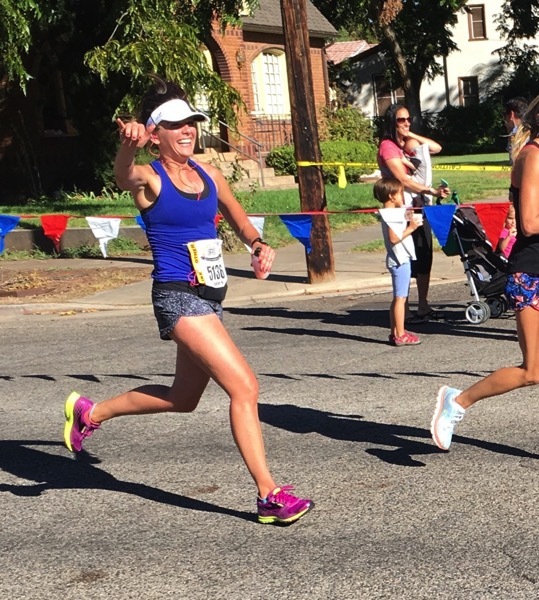 As a running coach and eating disorder professional, I have created a movement to REDEFINE our relationship with RUNNING. Often times, we are running for the “wrong” reasons. I like to cut through the myths and help others heal from disordered relationships with food and running and really live in freedom!!!! i love soups too! it’s like a warm hug on a crisp day. here are two that we enjoy. like so many above, i can relate to this on so many levels (aside from running marathons!). through HS i was totally normal and ate like a teenager. then i went to college, gained a ton of weight, and finally got my sh*t together junior year and started working out. i still ate and drank a little unhealthy, but started to educate myself and watch the booze and late night food fests more. then optometry school, oh boy. as a way to deal with the stress of crazy hours of studying, being away from home, all new people, etc, i worked out and at super healthy and lost a bunch of weight. i was really unhealthy and way too skinny, and it took years to get myself back to a state where working out/running makes me happy and is truly for mental health as well as body health (live long, be able to do every day things, not just be skinny!). i love how much strength i’ve built and the shape my body has now. i could probably still afford to gain a few, but its nice to have the flexibility and more importantly, being *good* mentally. First of all, I have to say – you look healthy and amazing and I’m so happy that you’ve found a good groove with food and nutrition. I have gone through the same thing. For years and years I tried to lose those last 10 pounds, but finally came to realize that my body is where it should be. I eat healthy and exercise regularly and my body is just at its set point. It took me a long time to get to this point, but I am so happy with the progress I have made. So happy for you Janae!! Healthy & beautiful bodies come in all shapes and sizes and I’m so happy you’re allowing yours to be healthy and beautiful…and how that will benefit Brooke!!! Anyone have suggestions for me??? I would have to say the scale still owns me basically. :( It’s sad. It determines my mood for the day and how i eat. I am probably just about the right weight now at age 47…. thin, but not sickly thin. My problem is that I destroyed my metabolism over the years of eating too little and distance running. In order to maintain my current healthy weight, I have to eat less calories than what I know is healthy. Every time I start bumping the calories up, the weight goes up. And I’m 95% clean eating. I love how much more energy I have when I eat more, but I just can’t stand the way I feel in my skin when I’m heavier….. is gaining weight the only way to reset my metabolism and will it ever reset? Well i wrestled 8 years, so the scale used to be very important to me. But not so much now. I’m starting to get into lifting just as much as running, so now i just check my weight to see if i’ve gained any muscle mass. And as of right now, i’ve gained 10lbs, and i’m the fastest i’ve ever been! In my opinion weight isn’t to opinion when running, it’s more about eating well and feeling well, everything else will fall into place.